Can contemporary psychoanalysis tell us anything about sexuality that is new and clinically meaningful? It most certainly can, answers Muriel Dimen in Sexuality, Intimacy, Power, a compelling attempt to revivify Freud's core interest, in "sexual impulses in the ordinary sense of the term." But there is nothing ordinary about Dimen's project. Drawing on contemporary relational theory, feminism, and postmodernism, she takes a sustained, sometimes irreverent, look at assumptions about psychosexuality. For Dimen, the shift from dualism to multiplicity that has reshaped a range of disciplines can also be brought to bear on our thinking about sexuality. She urges us to return to the open-mindedness hiding between the lines and buried in the footnotes of Freud's writings, and to replace the determinism into which his thought has hardened with more fluid notions of contingency, paradox, and thirdness. By unveiling the colloquy among psychoanalysis, social theory, and feminism, Dimen challenges clinicians and academicians alike to rethink ideas about gender, eroticism, and perversion. She explores, among other topics, the relations between Lust and libido; the limitations of Darwinian thought in theorizing homosexuality; the body as projective test; and the intimate tangle of love and hate between women. Generous clinical examples illustrate the ways in which a radical re-visioning of psychosexuality benefits therapists and patients alike. Mixing medium and message, Dimen draws on a variety of disciplines and styles to delineate the ambiguities, contradictions, and paradoxes that subtend sexuality in all its personal and clinical complexity. 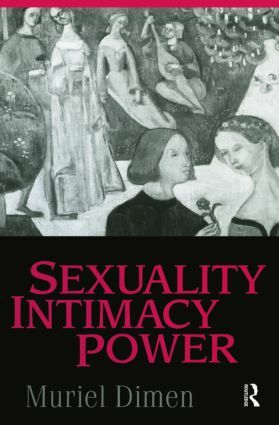 A brilliant example of contemporary psychoanalytic theory at its destabilizing best, Sexuality, Intimacy, Power is equally a historical document that will intrigue and enlighten students of women's, gender, and queer studies. "Muriel Dimen's book is an open and engaging treatment of psychoanalysis, feminism, and social theory. She offers an excellent overview of the debates, and reinvigorates hope that the tension among these fields will remain productive and alive. She coins new and surprising terms and ideas, and she works deftly to produce conversations among fields where there haven't been enough. Her work as a clinician and as a theorist come together in a humane, subtle, even joyous account of the complexity of gendered life." Adjunct Professor of Clinical Psychology at New York University, Muriel Dimen, Ph.D., is an Associate Editor of Psychoanalytic Dialogues and an Executive Editor of Studies in Gender and Sexuality. She is the author of The Anthropological Imagination (1977) and Surviving Sexual Contradictions (1986) and is the coeditor of several collections, most recently Gender in Psychoanalytic Space (2002, with Virginia Goldner).